Journalists in Palghar, a tribal-dominated district roughly 80 Kms from Mumbai, are incensed at the arrest of two of their colleagues ten days ago on charges of obstructing public servants on duty (Sec 353 of the Indian Penal Code). They believe that the increasingly aggressive police action is to serve warning to the public for all the protests in Palghar over the Indo-Japanese bullet train project and other projects. In a novel protest, they now plan to go to the Palghar police station en masse on Friday, July 6, to ‘file’ their reports and show solidarity with their colleagues. On June 22, journalists Ram Parmar and Hussain Khan, who report for the newspaper Hindustan Times and television channel Aaj Tak respectively, were arrested by police when they went to the police station to investigate reports that police had managed to capture one member of a dacoit gang. They managed to secure bail on June 25 and were released a day later, after spending four days in custody! On June 21, at about 11p.m., Khan went to the police station to investigate reports that police had arrested a member of a dacoit gang. According to reports, Khan was filming the suspect when police took objection and arrested him. An hour later, Parmar came to the police station and when he questioned police as to why Khan was being arrested, he was threatened with arrest too! Other journalists arrived by then and Parmar returned home, only to be picked up by police early the next morning. The duo spent three nights in jail before being produced before the Sessions court on Monday. They obtained bail but because of a power failure, the order could not be typed till the next day. They were released only on Tuesday, June 26. The Palghar District Patrakar Sangh President, Ramakant Patil, termed the arrests as a patently illegal act and a blatant attempt to suppress and silence the media. “We demand the suspension of Superintendent of Police Manjunath Shinghe, Police Inspector Kiran Kabadi and Police Sub-inspector Taufiq Sayed,” Patil said, adding that the arrests were clearly an attempt to intimidate journalists who were covering citizen protests over the mega- development projects. Concurring, criminal lawyer Vijay Hiremath told The Hoot that the Maharashtra government’s quiet amendment to Secs 332 and 353 IPC and Sec 309 of the CrPC was clearly a move to curb dissent and help the police and civic administration to quell any protests. “This just makes the process of securing bail all that more difficult and magistrates, who would otherwise grant bail, will now prefer to let the case go to trial,” he felt. Palghar police station is an unlikely site for free speech battles. In November 2012, Palghar police arrested two collegians, Shaheen Dhada and Renu Srinivasan, the former for commenting on Facebook about Mumbai coming to a standstill on the death of Shiv Sena leader Bal Thackeray and the latter for liking the post. The arrest, coming on the heels of several cases lodged under Sec 66 A of the Information Technology Act, sparked a furore, resulted in a petition challenging the section and ultimately, the striking down of the section as unconstitutional. 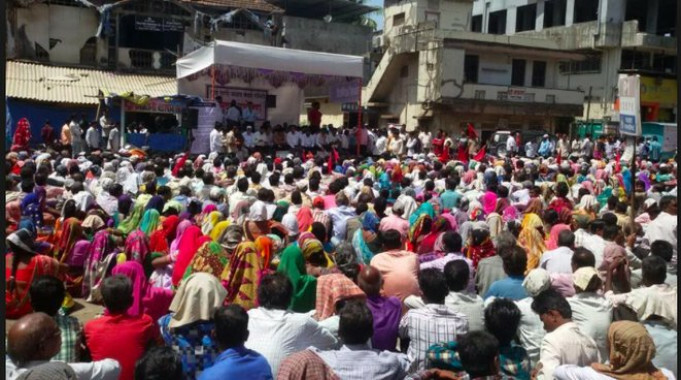 Over the last few months, and indeed just a month ago, Palghar witnessed a number of protests over the Mumbai-Ahmedabad High Speed Rail (MAHSR) project, the Mumbai-Vadodara super highway, the proposed Wadhwan Port in Dahanu and the conversion of at least 460 hectares of land acquired from tribals for a dairy project into an industrial zone. As if this were not enough, farmers of Palghar also found that water from Surya dam, reserved for irrigation in their district, would be diverted to the burgeoning populations of Vasai-Virar and Mira-Bhayander. It is partly because of the numerous protests here that the police are being increasingly aggressive, Patil says, surmising that Khan was targeted because he had lodged a number of complaints with police over drug trafficking in the area and had even complained to the SP that the PSI was not taking cognizance of his complaints. The police, local journalists say, were aided by a Maharashtra government notification dated June 7, 2018, whereby punishment for these provision was enhanced, for Sec 332 from three to five years and for Sec 353 from two to five years. Cases would have to be try-able in a Sessions court and securing bail becomes that much more difficult. Is Sec 353 becoming a handy tool for police? It seems so, if the experience of freelance journalist Priyanka Borpujari is anything to go by. In January this year, BKC police in Mumbai detained her when she was covering a slum demolition in Santacruz. Police charged her under Sec 353 (along with four women from the slum) for obstructing the demolition squad but she said she was filming the violent and brutal manner in which the squad was dealing with the slum-dwellers, including children. Borpujari later said a police officer told her that her mere presence was instigation for the slum-dwellers to protest more vociferously! While Borpujari told The Hoot that there was no further update in her case, the charge against her is still open. On June 4, barely three days before the notification came into effect, journalist Ranjit Mahanti had gone to NCH Colony, Kanjur Marg in Mumbai to cover a report on the death of a worker due to electrocution. He was dragged into a room and assaulted by security staff of the colony. An eye-witness called the police control room helpline and he was rescued by police and brought to Parksite police station. Mahanti tried to lodge an FIR against the security personnel but Senior Inspector Vilas Jadhav merely lodged a non-cognisable report. The journalist insisted on the lodging of an FIR and even staged a sit-in at the police station. Deputy Commissioner of Police (DCP) Akhilesh Singh told The Hoot that the journalist was not all that badly hurt in the assault. Hence, an FIR could not be lodged. If the journalist continued to stage a sit in, he was free to do so! Asked if the confinement of a journalist in a room was not considered dangerous enough to lodge an FIR, he said his senior officer was investigating the matter. Mahanti found to his dismay that, instead of taking cognizance of his complaint, police lodged an FIR against him on June 16, under sections 353, 504 and 506 of the Indian Penal Code. Police said there was no evidence of the journalist being confined to a room and beaten since the CCTV was malfunctioning at the time! Now, with the notification kicking in, Mahanti, who managed to secure interim bail, will face trial in the Session court. His own demand, to lodge of an FIR against the security personnel, now includes the plea to quash the case filed against him, says a press release from the Brihanmumbai Union of Journalists (BUJ). The BUJ added that journalists must have the freedom to collect information and follow up on tip offs. Instead, police were criminalizing journalists in the pursuit of their professional duty. Other provisions of the penal code as well as sections of the Information Technology Act are being made use of to rein in protestors or pesky reporters. As Adv Hiremath said, the charge of obstructing a public servant was the easiest to level against anyone even asking questions of public officials. In May this year, Avijit Michael, founder of Bengaluru-based petition site jhatkaa.org, was picked up by Mumbai police on a complaint lodged by the Managing Director of the Mumbai Metro Rail Corporation (MMRC), Ashwini Bhide, on charges of Sec 186 of the Indian Penal Code (Obstructing public servant in discharge of public functions) and of Sec 43 of the Information Technology Act (damage to computer, computer system, etc) for allegedly causing a DDOS (denial of service) attack on her official phone. The website had hosted an online petition and campaign by the Aarey Conservation Group (ACG) in December 2017, to protest the highly contentious destruction of the verdant colony for the Metro Car Shed. Scores of citizens rang up the official’s number, listed on the MMRC website to register their protest against the felling of trees in the colony and to demand the shifting of the carshed to another location. The result of the phone calls, around 200 in the span of two days in February, the official contended, was that she was unable to use her office phones for that period! Michael told The Hoot that the official did not respond to requests for a public consultation and then the campaigners stepped up their protests by asking members to call the official on her officially listed phone. “This was not a private number. It was listed on the site and meant for taking public grievances. How does it come under provisions of harassing or obstructing a public servant from doing her duty,?” he asked. As it is, information becomes more and more opaque by the day. And, as more and more Chinese walls crop up between public officials and the media, as well as other citizens, the right to ask questions will also be barred, metaphorically as well as physically.